Discussion in 'Comics' started by Zatrox, Dec 27, 2010. Personally I believe this is better suited for the comics section as opposed to the tutorial section. But I'll let a mod make the call. I love maple comics, making them and even more so; reading them! Which is why I hope that this tutorial helps and inspires beginners and advanced members alike. This tut is a work in progress. There is so much to talk about, but lets start with the basics. All my comics are made on photoshop, any CS will do. I use CS3 because I didn't like the pixel view that was implemented since CS4. It doesn't matter though its all preference. I know photoshop isn't really a noob friendly program but once you get the hang of the workspace and hotkeys it is the most efficient program for comic making. One of the most important thing I want to teach about comic making is making them more efficiently. The most important part of efficiency is your workspace. Over the years my methods have improved but have yet to perfect, hey we're all learning here. There is always the work frame and the layout frame. You do not do anything on the layout page but(obviously) layout the already made panels. The workpage is where everything comes together. 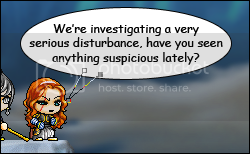 Your sprites, chat bubbles, special effects, ect. In this one PSD I made an entire comic issue. As I made frames I would simply hide past layers in case I needed them later. When I finished a frame I would export a flat frame to the layout psd so it could easily be shaped and moved. First, lay down the text and make sure its centered. I use comic sans but you can try other fonts, make sure the text is anti aliased, I usually set my text to sharp or crisp. Remember that if your text is more than one line(which it usually will be) the center lines should be longer than the top and bottom lines to match the shape of the oval. I see a lot of people make the mistake of not properly aligning text within the bubble. Create a layer behind the text layer. Use the ellipse tool (hotkey:) with the color white and try to encase all of the text without creating too much extra space. Make sure the size is proper, you can always move it after its made. 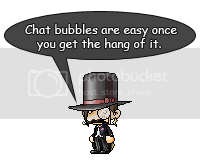 Add a 1px black stroke to the bubble. You can do this on the layer styles by double clicking the layer with the bubble. Using the pentool [P] make a triangle to point at the character the dialogue is being projected from. The pentool takes getting used to but you will get it I promise. 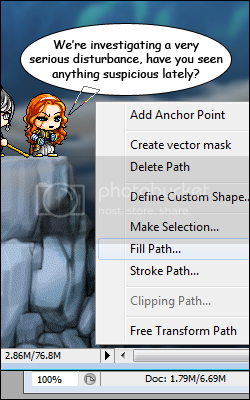 After you enclose the triangle, right click anywhere on the canvas while the pen tool is selected, then choose fill path. Have white selected so you can use foreground color. After the space is filled right click again and select delete path. 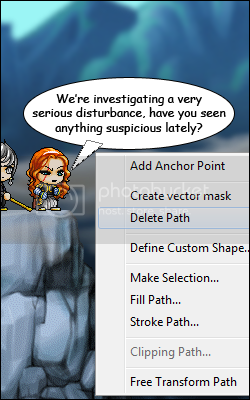 You can only delete path while the pen tool is selected, remember that. The order in which your characters speak is essential in good storytelling. If not layed out properly, your readers will read dialogue out of order and it will ruin it even if they catch it later. We've made it this far, but this is usually the make or break for comic makers. My comics are 600 px wide. Some comic makers go wider but I do not recommend it. It can get visually overwhelming and disrupt the natural flow of the frames. It lets the readers see too much at one time and it can ruin the suspense of the comic. There is no limit how long you can go, so go nuts. Image > Apply Image | Then just click ok. What this did is flatten the image and put it on the new layer for you. From here there are two ways to do this. The simple way or the complex(layer mask) way. I JUST started using layer masks myself and from what I can see it is far easier to edit but requires a little more effort in organizing your layers. Now that you have applied image simply drag and drop the applied image to the layout frame. IMPORTANT! : Newer frames always go on the bottom. That way when you drag in a new frame it will be under the rest of them. From here we can use the rectangular marquee tool [M] to select and delete the space that isn't needed. This frame takes an entire row but other frames should have all sides cut accordingly. I don't use this method for all my frames. But I have used it frequently when making dynamic frames. Its a very simple concept. You still want to create an applied image of the work frame, but on the layout frame you create the shape before you paste in the picture. So start by creating your custom shape. It doesn't matter how it's made. I use the pen tool to make my shape then fill path(any color I use dark grey). Now the only difference is you only have to press [ctrl+alt+G] to mask the applied image over the shape layer. And Voila! This method is nice because you can move the contents within the frame and keep the shape! Kudos to Ivan for this section cuz I referenced his tut from bsbg. I started using this method with issue 31 of VC. IMPORTANT! : When deleting the edges of a frame remember to ALWAYS have the EXACT amount of pixels in between each frame. It should be at least 5 but you can use any number as long as it is uniform across the entire comic. I always zoom into 500% view to count the pixels between each new frame. It is that important because uneven spacing between frames is a total comic buzzkill. If you're having trouble with panel spacing using dynamic frames just add a black stroke to your frames. I don't always get it perfect either, were all human but just try to make it seem uniform. If you're like me and have a signature text style or anything of the sort you can create a preset layer style. 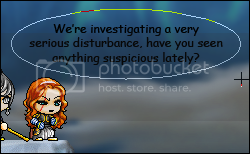 For example, my chat bubbles are gray color overlay with black stroke. I have set my desired settings then clicked 'new style.' Now all I have to do is click on the style tab at the top and select my preset! - When using the marquee or the move tool you can use the arrow keys to move exactly 1 pixel if at 100% or more zoom. - You can select several layers at a time to move or edit(to delete space on an entire row for example) by ctrl clicking layers or shift clicking. - If you didn't already know, when you are resizing/transforming something you can hold shift to constrain proportions. You can also hold shift to move things in a straight line with the move tool. - Never leave empty space in your comic. If you use my method there shouldn't be any anyways. - Never use anything but black for the space between frames. - I have personally grown tired of comic banners. I think they are a waste of space, but you can do whatever you want I'm not saying don't do it. - Be very careful when you make a zoomed out frame. Unless you do it right, it is very ugly and not recommended. If you feel like you need more space to display a fight or situation just make a larger frame. I have many frames that take entire rows, there is nothing wrong with that. - For an easy border, make a new layer on top of everything. 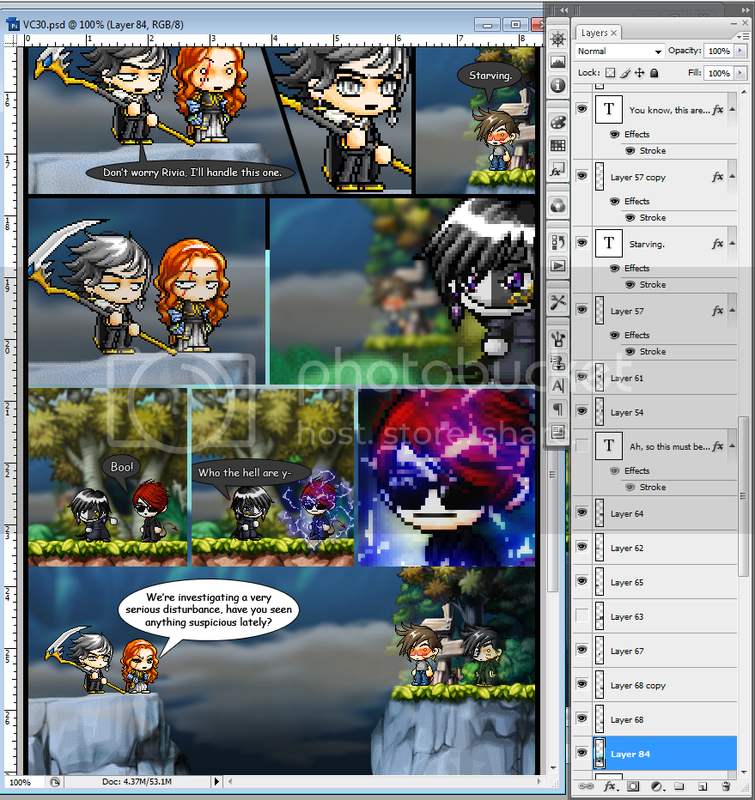 Select the entire comic with the marquee then right click and stroke inside with 5px(or whatever you choose) of black. That way when you are putting in new frames you don't have to worry about the edge. - I recommend you increase your history states. go to preferences [ctrl+k] then go to performance. I have mine set to like 100 and it always helps to be able to backtrack that far. So...uhh, since Tom said to give advice, my advice would be, use the guide as a starting point, but don't use it as an iron rulebook. Keep an open mind and develop your own style as you go along. Or as Tom says, experiment and learn. These are the things I usually keep in mind, but all the other things I do subconsciously. -MAGIC NUMBERS. DON'T HAVE ONE? GET ONE. Magic numbers is the term that I used to remind myself the space numbers. Mine is 7-11. 11 is the amount of space between rows and the canvas' side. 7 is the amount of space between each panels. -If you're stuck on a transition from one panel to another, work around it, add something else in between them. When I re-size it gets all blurry? This is because photoshop's image interpolation is set to bilinear by default. To change this press [Ctrl+K] to bring up your preferences and change it to nearest neighbor. Now that you're on this setting your transformations will still be pixelated. How long does your average comic take? Well it depends. My old ones used to take me around 3 hours to complete. Those were about 900 px long, my new ones are around 2500px+ long so they have taken me about well over 6 hours each. A lot of it for me is also making maps, making custom weapons and hair ect. I definitely have fun doing it though. This tutorial is still a WIP, there is lots of stuff still missing, I will probably add more videos later to clarify things. Also note this is not the definitive guide to maple comics. It is my own guide with my own preferences. We all encourage you to experiment and find your own style once you feel comfortable. With that said if you have more questions or need guidance, ask here or feel free to add my msn [email protected]. I would be happy to help. It's a great guide for someone who uses photoshop. I personally prefer PDN over all though. I follow 116's guide (old fag) because its my preference. I'll probably have Jackie and myself do some what of the same thing as this, giving our inputs on how we work, but both of us are busy at the moment (well I'm just lazy xD). If it does comes down to that, I'll possibly rename the thread and delete some posts to get our posts up there, or if you don't mind we can start this over. I believe in working and experimenting, someone is not always gonna be there to hold hand and teach you. Very nice guide. Your workspace for making a comic is interesting, mainly since it's the first time I've seen this workspace style, but nonetheless, it's pretty efficient. But although it's a great guide to start with, like you mentioned, this is a guide with your preferences. Unfortunately, when presented with a guide, people tend to set it as an iron code over what to do. Shouldn't this be in tut section? I view this more as guidelines, but I'll make the final decision later. I personally thought that it would get more relevant views here. Considering the tut section is labeled specifically for animations. To anyone saying anything other than photoshop: LOLOLOLOL GOOD LUCK MAKING THINGS 10,000 TIMES HARDER ON YOURSELF. I forget the hotkey for layer masks. It does sound like itd make it easier to make adjustments. Actually making comics on FW is fairly easy, but because of this I might be looking into investing into Photoshop. Fairly easy, but will limit your potential a lot. Photoshop is where it is at. - layer mask layout method.